Even the cold weather was no match for Stephen Gonsalves on Saturday night. The Twins' No. 3 prospect threw 5 1/3 hitless innings in his season debut as Double-A Chattanooga shut down Birmingham, 2-0, at a frigid AT&T Field. The Lookouts held the Barons to one hit in the contest. Gonsalves set down nine of the first 10 hitters and the only blemishes on his line were three walks. He fanned three and threw 43 of 71 pitches for strikes. "I think that's the coldest game I ever played in," the San Diego native said. "I think it got down to 32 degrees, and I couldn't really get my finger on the seam to throw my slider, but I had my curveball and changeup working and my heater was in the strike zone all night. I've pitched in this league before and I've had good results. So I just wanted to go out there and throw as many strikes as possible and keep hitters off-balance. "It feels good to get the first one out of the way." Despite not surrendering a hit, the 23-year-old was lifted after getting Ryan Brett to fly out to start the sixth. "When I went out for the sixth they told me I only had 12 pitches left," MLB.com's No. 79 overall prospect said. "After that first hitter had a long at-bat, I knew that was it. I still gave my manager a long staredown to let him know I didn't want to be taken out. I was just playing around, I have a good connection with the coaching staff here and we have fun." Gonsalves said he is going to be on a 75-80 pitch soft count for the next three starts. He opened last season with the Lookouts and went 8-3 with a 2.68 ERA and 96 strikeouts against 23 walks over 87 1/3 innings. That earned the 2013 fourth-round pick a promotion to Triple-A Rochester, where he surrendered 14 runs in 22 2/3 innings. This spring, Gonsalves appeared in two games with the Twins before being reassigned to Minor League camp. In 3 2/3 innings, he gave up a run on six hits and two walks with one strikeout. "I was a little surprised," Gonsalves said, recalling his reaction to his assignment. "But the Twins have so much depth that it doesn't really matter where you go. There are more experienced guys at the next level, and there are more things I need to work on to tighten up my game so that's my focus here right now. "You know, I've never been in cold weather and I hear it's snowing [in Rochester] right now, so that could be another reason I'm here." Twins No. 16 prospect Tyler Jay relieved Gonsalves and retired the first four batters he faced before giving up the Barons' only hit on a two-out single in the seventh by 22nd-ranked White Sox prospect Seby Zavala. 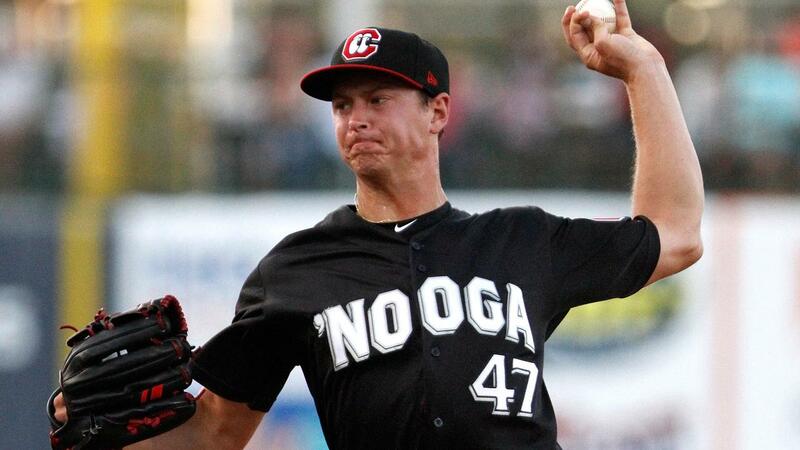 Zack Jones and Ryne Harper each worked an inning to finish up the Lookouts' first shutout of the season. Edgar Corcino drove in Tanner English with a sacrifice fly to right field in the third to get the Lookouts on the board and put Gonsalves in line for the win. In the seventh, Wynston Sawyer came in to score on a single by Sean Miller to complete the scoring.